Welcome to Day 5 of our 5 for 5 Thanksgiving Blog Event. Today our theme is "Texture". We are all sharing a project where we used textures. It's been such a fun week. I can't believe it's over!! Some of us are offering prizes, so be sure to visit all the links below and leave comments. For my card, I added a solid orange panel of Tim Holtz Kraft Core card stock. Then I layered a piece of Tim Holtz Seasonal Kraft Core card stock and sanded it a little so the images would show. The pumpkin is a Tim Holtz die that I cut with grunge board. I covered the pumpkin with several Distress Inks and paints and then added some glitter. The greenery on the bottom is from another Tim Holtz die. The sentiment is from the Tim Holtz Occasions Small Talk. Thanks for stopping by and be sure to check out all the designers blogs below for more Thanksgiving Inspiration. 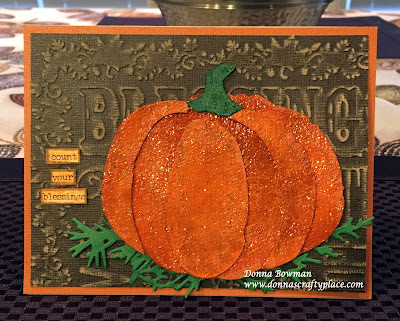 Love the embossed card front with the textured pumpkin. Very very pretty. Thanks for sharing! 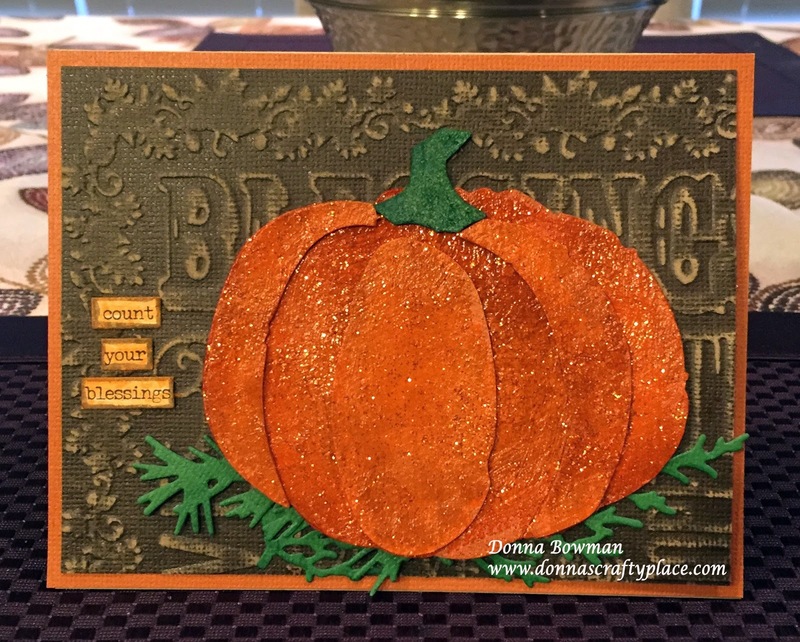 Wow...what a gorgeous pumpkin card,it's so amazing,love it! Love it ... that kraft core is so fun to work with ! Beautiful card Donna! Love the gorgeous pumpkin! Hope you and your family have a Happy Thanksgiving!